Actually, Kari and I did more shopping afterwards in the nearby town of Shepherdstown, which also screams history and has great shops – just more of them. Shepherdstown also has a good art and music scene I understand from Kari and my friend Marcia. 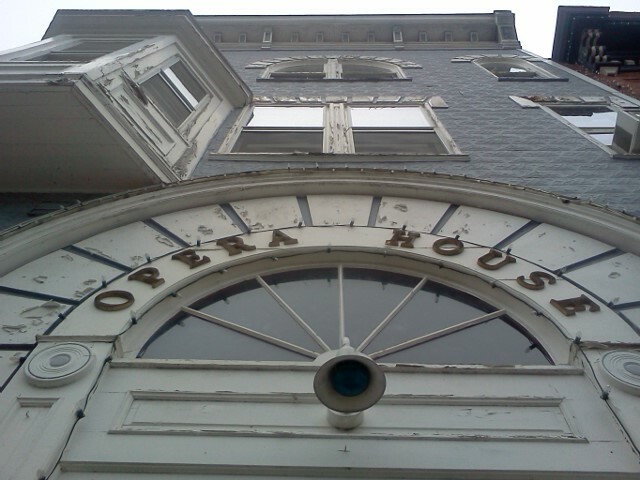 Here is the old Opera House, used still for plays and music. Excellent post! I visited Harpers Ferry and loved the area so much, I decided to live here. I hate to be the fly in the ointment. But we mountaineers take something quite seriously. Harpers Ferry is in WEST Virginia, not Virginia. Otherwise, great photos and great write–up about our little town. And I definitely recommend visiting in the warmer months. The historic part of town takes on a completely new dynamic, full of tourists and frequent reenactments. And the ice cream IS amazing! aie. I knew that. Truly. I was even the driver out there. But I apparently spaced out a bit while writing that. Thank you for the correction! And thanks for liking the blog.